Arapaho is a fast-growing blackberry that forms fruit early on its tall, upright, self-supporting canes. 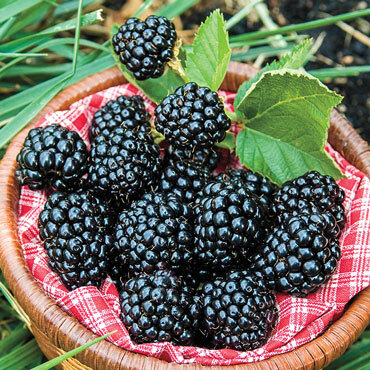 The blackberries ripen in early to mid June, allowing you to enjoy 8-10 quarts of luscious berries before the heat of summer. Perfect for those early-summer festivities where you'll want to use delicious berries in all your desserts. Each berry is 1-2" long with a gorgeous blue-black shine and tiny seeds. It's incredibly hardy, with high disease resistance, and beloved for its ease of picking. For that reason, it makes a great project for kids! Plant with them, then encourage them to help water and watch it grow. They'll love picking the high yields of ripe berries! Zones 5-9. U.S. Patent No. 8,510. Spacing: 4 feet apart in rows 10 feet apart. Depth: Same depth as they were in the nursery. Plant sow roots are 1 inch below soil. Yield: Approximately 8 - 10 quarts per plant. Fruit: 1 - 2 inch berries. Soil Preference: Well-drained, rich, sandy loamy soil. 5.5 - 6.8 pH.